Biafraland especially Abia state has become a killing field and gulag of late. The Nigerian army killed IPOB members, kidnapped Mazi Nnamdi Kanu, leader of the Indigenous people Of Biafra from Afara Ibeku his hometown on the 14th September 2017. The Nigerian Army came on the pretence of conducting training for their men, which they code-named operation python Dance through which they committed numerous atrocities against Biafrans. Now they have started another one called operation crocodile smile, which is targeting riverine Biafraland. Soldiers are intimidating Biafrans in our land, they kill, they maim, they arrest and loot properties. The prisons in Biafraland that are already overcrowded above capacity are now overflowing with lPOB members. Over 60 IPOB members are languishing at Afara Prison Umuahia, while in Aba IPOB members that are inside city prison are above (30) including (6) under-aged in police custody. Names: -Chidiebube Ngozi, Ebuka Sampson, Isaiah Bassey, David Okoro, Ubabuko Tochukwu, Oluebube Okeke, all are 15 years or below. More than (60) IPOB members are still in police detentions waiting to be arraigned. 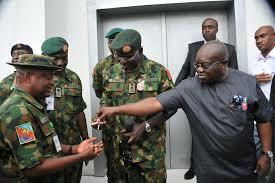 Many are in army, DSS and SARS detention facilities while many are kept in secret detention centres. It should be noted that the only crime committed by these innocent Biafran citizens is exercising their inalienable right of self-determination. All these are going on with the approval of Okezie Ikpeazu, the governor of Abia state and other southeast governors and politicians. These politicians only remember the people every four years when they come to ask for our votes, after that they forget about us and worse still, they connive with our enemies to kill us. This is why we are calling on all Biafrans to boycott every election in Nigeria starting from Anambra state Guber election slated for 18th November 2018. We are calling on the world to hear our cry and come to our aid, United Nations should not stand by the side and watch while ethnic cleansing is going on. The intimidation and injustice are too much to bear.